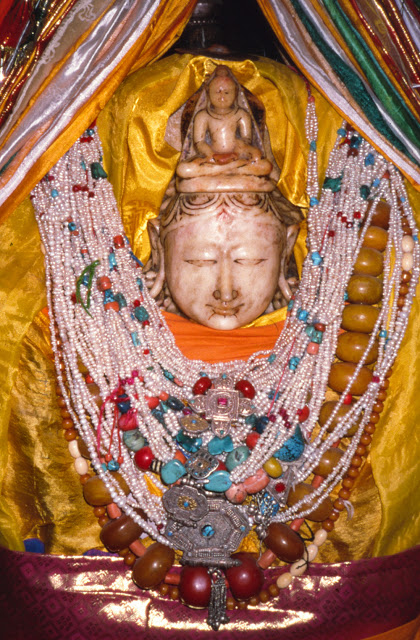 The noble face of Chenrezig peers through abundant jewelled offerings left by countless pilgrims over the years. According to Buddhism, high-level meditators and enlightened beings attain the realisation of Emptiness (the highest wisdom) and Bodhicitta (the ultimate compassionate wish to benefit others) through tremendous effort and practice. Since they have achieved such powerful attainments, they become worthy objects of refuge. That is why they naturally infuse their environments with the blessings of their attainments, especially in the areas where they engaged in their practices. Hence, there are many places that are associated with great meditators, enlightened beings and mahasiddhas who have shown miracles. In some of the places where such great beings have practised or appeared, self-arisen images of the deities have manifested. 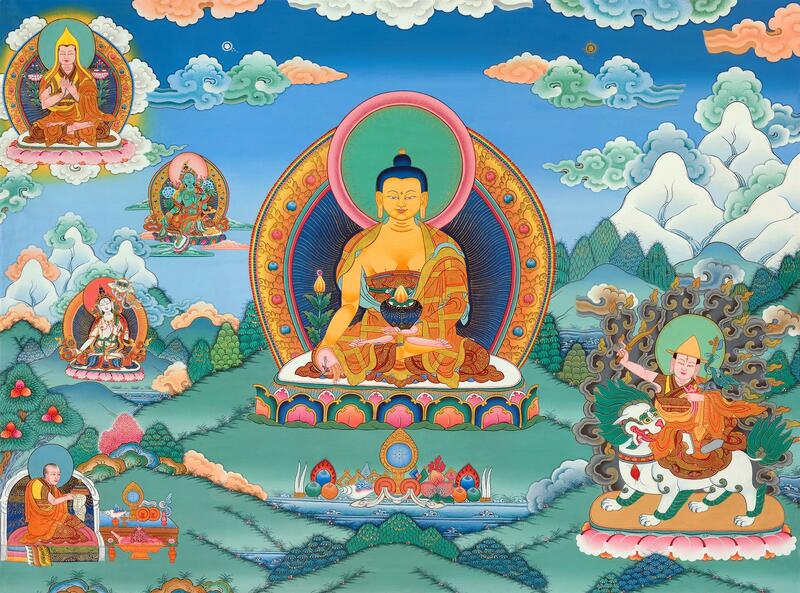 These images appear miraculously in order to benefit sentient beings by becoming objects of worship and veneration through which we are able to connect with the enlightened beings, generate powerful aspirations, and accumulate tremendous amounts of merit. One of the abilities that we attain when we achieve Enlightenment is that of ‘instant magical emanation’ which is mentioned in the King of Prayers, also known as Samantabhadra’s ‘Aspiration to Good Actions’ from the Gandavyuha chapter of the Avatamsaka Sutra. This is the ability of an enlightened being to manifest innumerable emanations simultaneously. Each emanation possesses the same mind but a different purpose or disposition to benefit sentient beings. These emanations can even take on the form of inanimate objects in order to be of benefit to sentient beings. Hence, it is not unusual that the great Bodhisattva of Compassion, Chenrezig, manifested as a self-arising statue. This is a rare picture of the unadorned Chenrezig statue, which reveals the six-armed iconography that features Buddha Amitabha on the crown of his head. Chenrezig is the Tibetan name for the famous Bodhisattva named Avalokiteshvara in Sanskrit, the language of ancient India, or Kuan Yin in Chinese. He is considered to be one of the Eight Great Bodhisattva Disciples or ‘Eight Close Sons’ of Lord Buddha. 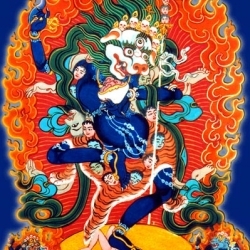 The other Great Bodhisattva Disciples include Manjushri, Vajrapani, Maitreya, Ksitigarbha, Akashagarbha, Samantabhadra and Sarvanivaranavishkambhin. 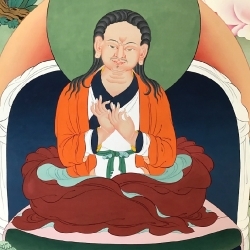 Chenrezig is famously known to embody the Buddha’s great compassion and manifests both in male and female forms according to culture and the needs of society. He is frequently depicted holding the stem of a lotus, which is why he is also known by the epithet, ‘Holder of the Lotus’ or Padmapani. Chenrezig is widely considered to be the patron Bodhisattva of Tibet and is worshipped by all the great lineages of Tibetan Buddhism. One of the most famous and highest incarnation lineage such as the Dalai Lamas are believed to be emanations of Chenrezig. 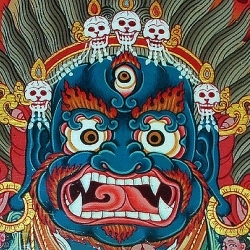 In Tibetan mythology, Chenrezig is believed to be the progenitor of their race. A large golden lhari or parasol is hung over the image as an offering to signify the noble Chenrezig’s exalted state. According to legend, there was a Tibetan boy who travelled to the Triloknath Valley in the Lahaul-Spiti region of India. Although to all appearances he was a simple shepherd boy, he was in fact an emanation of Chenrezig himself. Every day, he would herd the village goats up to the grasslands by a small lake in the mountains to graze. Unfortunately, upon returning to the village, the goats could not produce any milk. The village people began to suspect that the shepherd was milking the goats for himself and gave him a stern warning. Feeling wrongly accused, the shepherd decided to investigate what really went on when the goats were up in the mountains. The next day he took the goats up to the mountains as usual and hid nearby hoping to catch the thief who was stealing the milk. He waited for a while and saw a glowing figure emerge from the lake and begin to milk the goats. The glowing figure turned out to be Chenrezig and he was drinking the goats’ milk. The shepherd ran over and approached Chenrezig, explaining that the villagers were accusing him of stealing the goats’ milk for himself. He requested Chenrezig to go down to the village with him and tell the local people that he was the one drinking all the milk. Chenrezig agreed to do so and asked the shepherd to carry him on his back down to the village. Chenrezig also advised the shepherd that he might hear certain strange noises as they set out on their journey but whatever he heard, he should not look back. As they descended the mountain, the shepherd heard a loud sound and, in the spur of the moment, he forgot Chenrezig’s instructions and turned back to see what was happening. 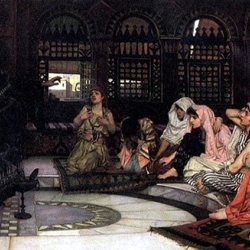 It is said that he saw seven men dressed in white following behind. When these seven men realised that the shepherd was looking at them, they immediately transformed into seven Nagas (serpentine beings) who eventually disappeared into the hillside. The facade of the Trilokinath Temple is unique for its amalgamation of Hindu and Buddhist elements and symbols. It is said that if only the shepherd had followed Chenrezig’s advice not to look back, there could have been more holy objects (the nagas were carrying them) to liberate sentient beings, but due to our collective negative karma, that did not manifest. As the shepherd continued on his journey back to the village, Chenrezig became heavier and heavier. By the time they reached the village, there was conflict and fighting amongst the villagers and Chenrezig had by then become far too heavy to carry further. The shepherd then dropped Chenrezig onto the ground and discovered that he had miraculously transformed into pure white marble. 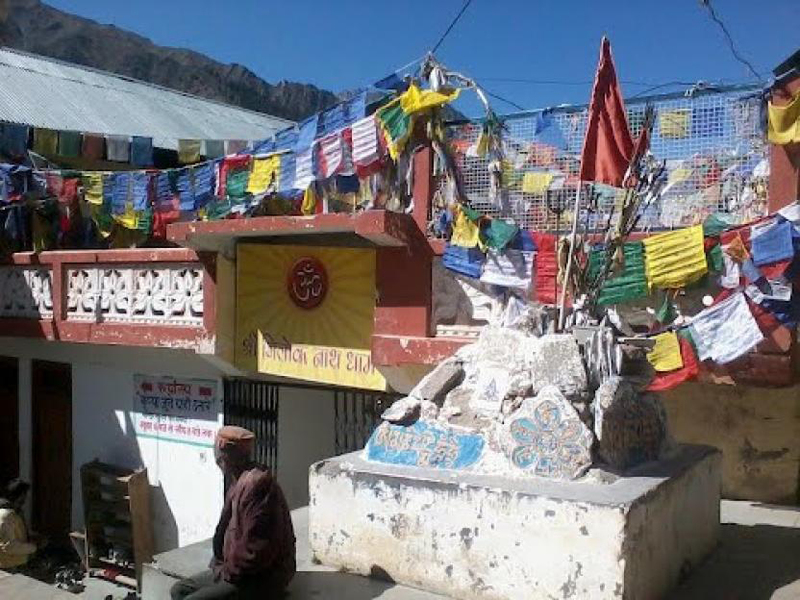 Therefore, it is said that this statue is actually Chenrezig transformed into a marble statue. 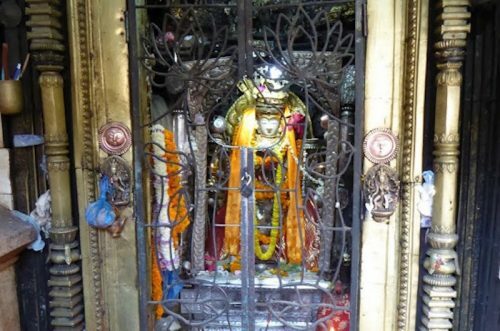 The shepherd himself also transformed into stone and both images, along with a black stone carving of the Four-Armed Mahakala with a naturally arising OM MANI PADME HUM mantra at the back are enshrined in this small temple. Several miracles associated with these holy items have been reported over the years, including the statue speaking and dripping nectar. His Holiness the Dalai Lama has even appointed a caretaker who looks after the monastery here. Ever since that day, many Buddhist pilgrims, particularly from the Himalayan region, come to the Phagpa Temple at Triloknath, Himachal Pradesh in order to pay homage, pray and also to engage in Nyungne fasting retreats with Chenrezig as their focus of worship. 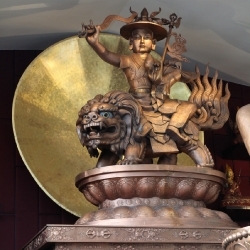 It is believed that aspirational prayers made to this Chenrezig statue and image of the shepherd will be fulfilled. One can also walk three to five hours up the steep mountain to see Omay Tso (literally meaning Milk Lake) from where Chenrezig is said to have emerged. The water of the lake is white in colour and descends in a powerful downwards stream towards the village. Hence, this little temple has since become a popular pilgrimage spot. The courtyard of the Trilokinath Temple features large Buddhist prayer wheels, granite lingam and small Nandi (bull) representing Shiva, while the ancient wooden pagoda-style temple is decorated with Tibetan prayer flags. the jewel mountain upon whom we should all rely. in the center of a pure and fresh lotus. 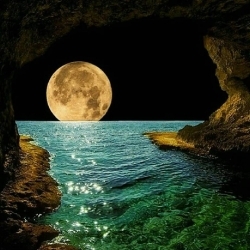 In the world you radiate with perfect clarity like the moon when full. and great joy is spread everywhere. it nevertheless burns away the hordes of demons. mandalas of detailed elaboration nevertheless appear to it. Though you have crossed over samsara, you constantly show birth in the three realms. The wise are amazed at such illusion-like activities. Relied upon constantly by all fortunate beings, you are the uncomplaining great earth. Dispelling the darkness of ignorance of the entire world you are the blazing sun. Soothing the torment of the mind burned by anger you are the moon. You show the mandala of your beautiful face like a fully bloomed white lotus. As white as rock crystal and a pure conch shell, you possess the beauty of youth. radiant amid an entourage of countless sugatas, bodhisattvas, and wrathful deities. and brought to enjoy the supreme bliss of the gods. the mighty Buddha Amitabha sits beautifully in its center as your lineage crown. Your right hand in the mudra of giving, from whose fingertips constantly fall drops of white nectar like shining pearls that soothe the torment of the hungry ghosts. a beautiful and pure form prostrated to by Brahma, Indra and other arrogant gods. You are, therefore, the Mighty One of the World. of the wheel, the lotus, the arrow, the bow, and so on. Possessing a thousand eyes, you show perfectly eleven beautiful faces. and to others you are Amoghapaśa, Nilakantha, and so forth. but your mind never strays from compassion. all of which is done without the thought to move even a single hair. Like rain falling from the clouds, you have no deliberation. You have left behind all words that do not in any way serve living beings. teaches pathways of Dharma greater in number than the drops in an ocean. Those whose ears receive your speech will dwell perfectly within your words. your words delight the mind, but will destroy the desires of the desirous. and yet for those struck by fright, their fear is at once reduced to mere words. of the Buddhas of the past, present, and future. you are renowned as the guru of all worlds. out of anger, they are intent on killing themselves. 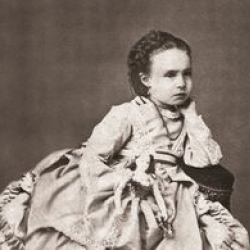 as a mother would look upon her only child. even the tiniest thought of doing harm to others. cannot come anywhere near a fraction of your compassion. in the scented waters of camphor, sandalwood, and vetiver grass. is constantly embraced by the supreme bliss, with all movement stilled. 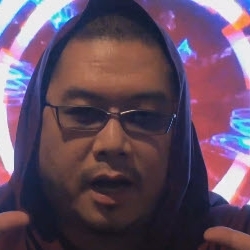 To such a mind, I prostrate. where others are boiled like grains of wheat in vats of molten copper. where flesh and bones are torn apart by the cold. and who are constantly weary and tormented by thirst. and that they will be able to live a life of happiness. where even his bones and marrow will be burned away. and be dragged across ground strewn with sharp iron thorns. Those that are high will quickly become lowly servants fit only to be kicked. 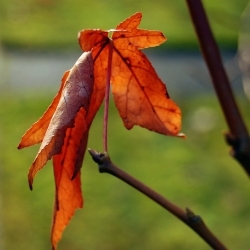 Like the flowers at the end of autumn, this time of youth will soon fade. Like enjoying a borrowed ornament, this wealth will definitely disappear in time. Like a flash of lightning, even my life appears only for a moment. and it is I alone who must wander in its dense darkness. the deception of the mental afflictions will ultimately let us down. I beg that you lift us with the hand of compassion from this ocean of suffering. and like naked wanderers, have abandoned all shame. and engage in acts looked down upon by the wise. Alas! the sun of the sacred Dharma has almost set between the mountains. fight among each other, and mistreat the weak. and cannot even find meager food. then what did your promise of the past mean? Who can your subjects turn to for refuge? Even your own name is blessed. Whoever hears it will be freed from fear. similar to performing devotions to countless Buddhas. will rescue these desperate sentient beings. that they have faith in cause and effect and follow always the path of Dharma. who have fallen into this dreadful state of samsara. and may I strive over many lives to work for others with compassion. and nourish living beings over a long time. that is this garland of words of exultation and lament. by that great and supreme conqueror, Avalokiteśvara. This praise and prayer to the noble lord of the world, Avalokiteśvara, that brings forth the rains of happiness and well-being, was composed by the Dharma teacher, and fully ordained monk of Sakyamuni Buddha, Losang Kalsang Gyatso (the Seventh Dalai Lama). Translated, in accordance with the commentary of Könchok Jikmé Wangpo (first incarnation of Jamyang Shepa), by Gavin Kilty, January 2014. « The 4th Edition of 'The Promise', the Pictorial Biography of H.E. 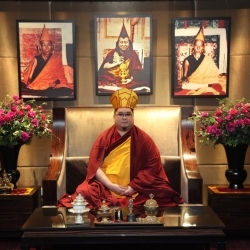 Tsem Rinpoche Is Out! The bodhisattva ideal, is one of the highest spiritual motivation one can aspire to, as it involves enduring for as long as samsara is still in existence. 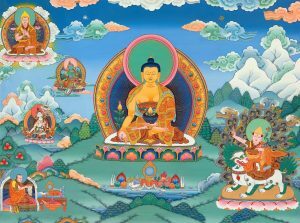 The Bodhisattvas toil on endlessly for the sake of all sentient beings, and they do it with all the 6 Paramitas perfected. 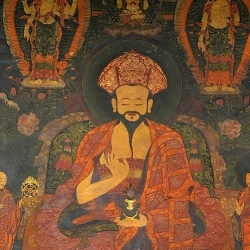 Chenrezig is one who fully represents that ideal. It’s amazing to see the self arising images of the holy places and also to read the stories. All the Buddhas and Bodhisattvas have great compassion in emanating in various forms in order to suit the people of that place to pray, practise and generate merits. We are so fortunate to have our Guru Tsem Rinpoche to guide us and share with us all the dharma and holy places so we can learn and widen our knowledge. 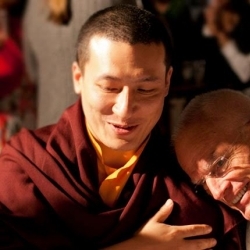 Thank you Rinpoche and Pastor David for sharing this beautiful article. Self-arising images arise because of the sacred energy in this place and it is a great place to visit as we are blessed by such divine presence. I feel very fortunate to learn about how these statues arise and how it can help people who come to visit. We need the blessings of these divine messengers so that we can connect in our future lives with the Dharma and continue on our path. Miracles happened in places whereby such great beings have practised before and self-arisen images of the deities have manifested. 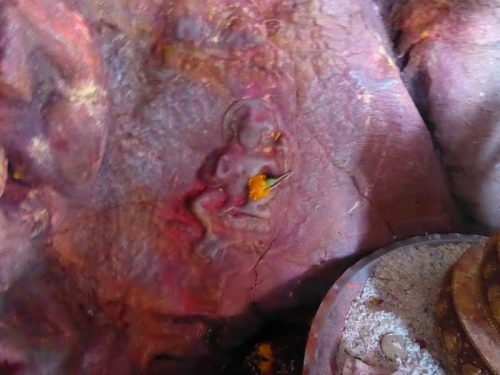 I have heard of these before and saw one before on the a descending rock wall near a Chinese temple in my place years ago.These images appear miraculously in order to benefit sentient beings by becoming objects of worship. To see a self arisen images of Chenrizig in Phagpa Temple at Triloknath, India is blessing as this place having strong energy . Feeling excited after reading the amazing story behind this self arising Chenrezig . Thank you Rinpoche and Pastor David Lai for sharing this article and those beautiful pictures . I love reading stories about enlighten beings. They appeared to help and to bless people. I believe enlighten beings does exist to show signs and miracles, sometimes to test our faith and sincerity. 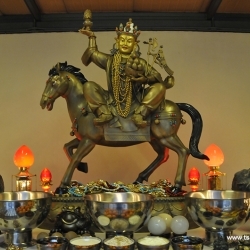 i have read stories about Manjushri appeared in Wu Tai Shan and many holy places. I also saw the self rising tara on the rock in Nepal. because of all these legend, miracles and amazing stories that people gained faith in Buddhism. When we have faith, we practice. People like to meditate and pilgrimage at these places to gain blessings. At the age of degenerate time, many have lost touch and loosing faith in these stories. Although at this moment we cannot see them but with strong faith and sincerity i still believe they are around us helping and guarding us always . All the buddhist enlightenment being will find way to emulate different form to help sentient being need. I have no doubt enlightenment being like Avolokitieshara manifest become stone statue in order to help others at India. Holy being such as Lama Tsongkhapa meditate in the cage behind Gaden monastery in Tibet, Pabongka meditation cave manifestHeruka eye, Guru rinpoche cave in Nepalese have self arising Tara. Those plase have their holy energy and aspiration prayer and manifet miracle sign at their meditation spot. It bring many people with faith came to pilgrimage and make offering. H.E. 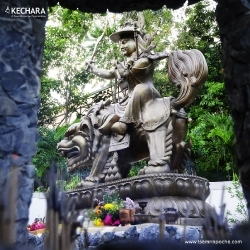 Tsem Rinpoche have advise his students make strong prayer for dharma to grown in KFR. At future, miracle sign will show at KFR when dharma start growing and more and more practitioner will come to practice in this land. Thank you for sharing . In Buddhism enlightened beings who manifested and emanated to any forms with the purpose to benefit all sentient beings. And is not only for that time but pass on from generation to generation in order peoples can visited the place and get blessings and also for spiritual grow. May I have the opportunity to visit in this Phagpa Temple at Triloknath in this life. It is interesting to read this story, it is amazing that how Chenrezig transformed into a marble statue and all these is due to because the shepherd did not listen to the instruction of Chenrezig, this also remind us that when our guru gave us instructions and we do not follow, even it is as simple as do not turn around, it is just a very simple action to turn our body around, but the consequences are huge, it is not only about us, but it will affect so many people around that could not get the blessing or the teaching of Dharma, when they missed out this opportunity, we won’t know how many lifetime more they have to take until they can meet the Dharma again. Hence, we must always follow our guru’s instructions even though we may not see the logic behind or the purpose of it or how difficult it is, when the instructions was given, it is definitely beneficial to not only us, but also the people around us. Self arising images and all other miracles are always associated with highly attained practitioners. Self Arising Chenrezig is no different. 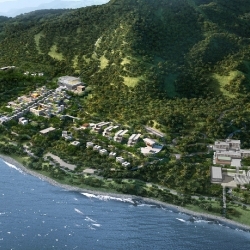 Just like Self Arising Tara which is also situated near Guru Rinpoche’s cave and there is also a very sacred Vajrayogini chapel near by on top of the hill. It may be referred as miracles to us but in reality these are actually energy generated from very positive actions which is a norm in Buddhism world. It is always interesting reading stories of Buddha. I like the part where the shepherd heard sound while carrying Chenrezig and he turn around, saw the seven white dressed men then transform into nagas and disappeared. 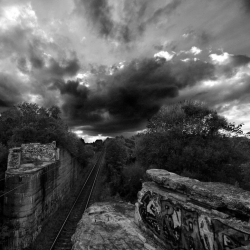 There are so many mysterious stories that we haven’t heard or encountered. Personally, I experienced few times in one of a temple at my hometown. 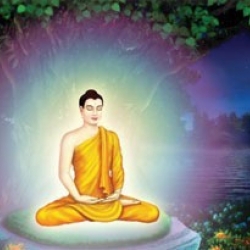 I witnessed the Buddha Shakyamuni will blink his eyes and many witnesses too. I believe it is our faith to the Buddha and our karma to accept it. It is interesting to know about the story of this self arising Chenrezig. As for my own experience, I personally witness the self arising Tara at Parphing, Nepal. 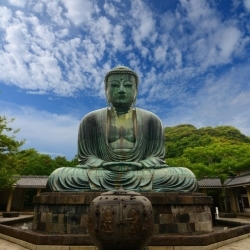 I guess this is because of the positive energy generated by the great masters who meditated in that area and maybe because the people in that area need the guidance from a Buddha. That is why Buddha image arose in many forms to help the people in that area due to their karmic link. Interesting sharing by Pastor David. Strongly agree that many places that are associated with great meditators great meditator, enlightened beings and mahasiddhas, the place will have strong energy that one can get blessing by visiting them. Many things happened due to our karma and since we are at this degenerate time the enlightened being will create their appearance to benefits us. 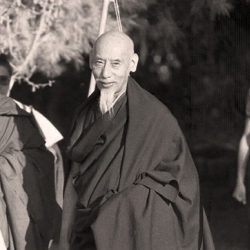 Stories abound of many enlightened beings who manifested and emanated to benefit all sentient beings. I am sure these stories are real, perhaps the narration could have differed from the original after being told several times by different people over a long period of time. What I do not see or do not hear does not mean the stories are not real. 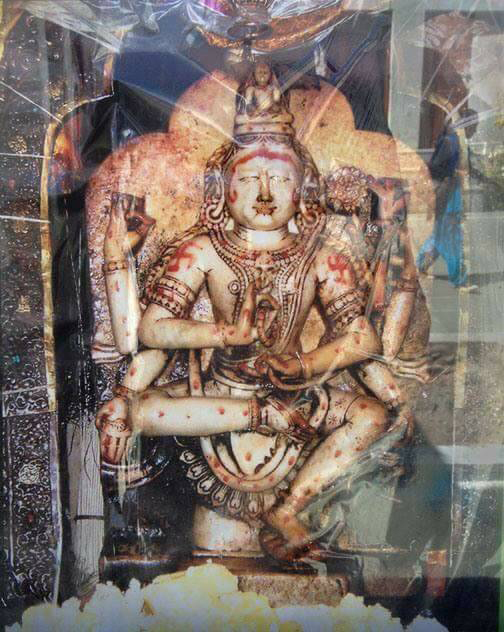 But I have seen the image of the Bodhisattva Tara that self arose on a big rock in Pharping, Nepal. Behind Tara is another self arisen image of Ganesha (Ganapati). Over the years I have visited Pharping a few times, and each time I visited I saw the image of Tara becoming clearer. If anyone who plans to go to Nepal, add Pharping into your bucket list. Apart from the self arising Tara, there are other holy sites that one can visit. 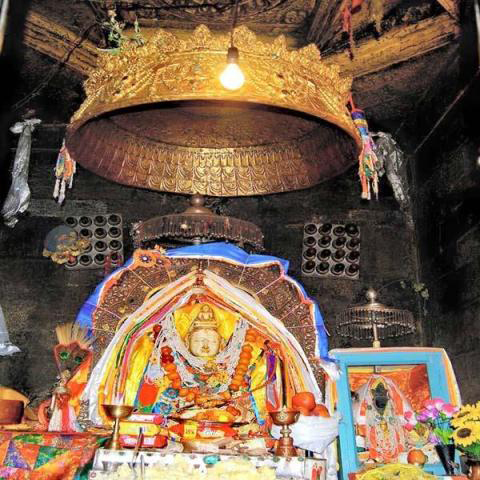 There is the Guru Rinpoche (Padmasambhava) retreat cave, and a VajraYogini chapel housed in the home of a Nepali family. This shows that through spiritual practice and attainments used to benefit others, holy places arise and bless the people and surroundings. And holy beings definitely exist! What a beautiful powerful praise of Chenrezig by the Seventh Dalai Lama! This garland of words of prayer invoking the blessings of Chenrezig and making heartfelt pleas to him to send a rain of nectar to each of the six realms and to the beings of this degenerate age (full of their delusory pursuits )to relieve and eliminate suffering, is just so spiritually charged with love and compassion! The story of the shepherd boy and the statue of Chenrezig turning into stone,demonstrates very clearly the great compassion and forgiving nature of Chenrezig. 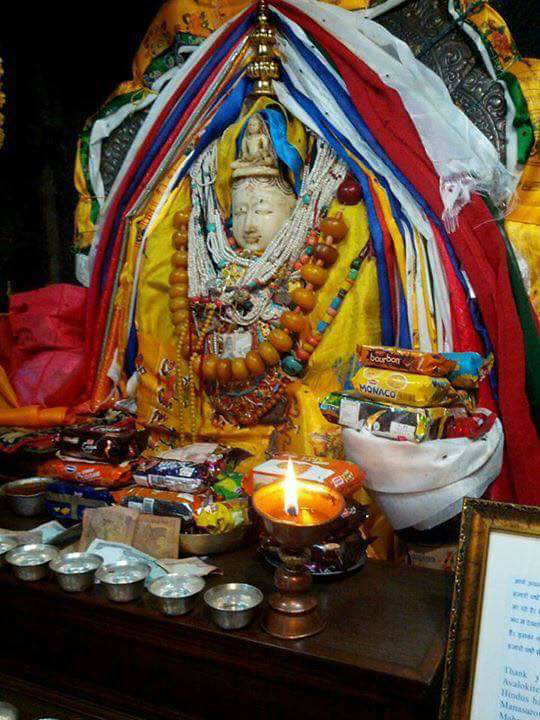 In order to help and benefit all, the statue of Chenrezig manifested as a self-arising Chenrezig to bestow his blessings and protection on all. 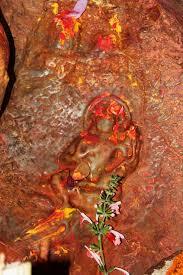 Enshrined in the Phagpa Temple at Trilokinath, it has performed several miracles over the years. Hence this has become a popular pilgrimage spot and aspirations made here have been known to be fulfilled! 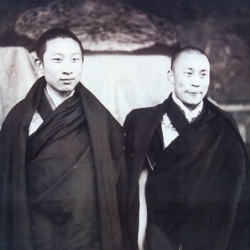 Thank you Rinpoche and Pastor David Lai for this beautiful post of the self-arising Chenrezig. Thank you Rinpoche and Pastor David Lai for the above story.